Apple CEO Tim Cook issued an internal email to employees on Thursday saying that while a personal appeal to President Donald Trump to keep the United States in the Paris climate agreement failed, corporate environmental efforts will continue. According to the letter to employees, a copy of which was obtained by Axios, Cook discussed the matter with Trump on Tuesday, two days prior to the White House decision. The email confirms reports that Cook personally reached out to Trump in an attempt to sell him on the deal's benefits, not only for the U.S., but for the world. Trump opted to ignore Cook's advice, and that of other technology industry leaders, and on Thursday announced plans to withdraw U.S. participation. Notably, SpaceX and Tesla founder Elon Musk made good on a promise to abandon his post on two White House advisory councils, a move later followed by an identical resignation by Disney CEO Bob Iger. Intel CEO Brian Krzanich told CNBC that he will continue to advise the president, as will IBM CEO Virginia Rometty, though the latter has come out in support of U.S. involvement in the accord. Other tech leaders, including Facebook CEO Mark Zuckerberg, Microsoft president Brad Smith, Salesforce CEO Marc Benioff and Google CEO Sundar Pichai slammed Trump's decision on various platforms, mostly through social media posts. While the federal government moves further away from aiding in the fight against climate change, Apple is forging ahead with its own green efforts, Cook said. "Climate change is real and we all share a responsibility to fight it," he said. "I want to reassure you that today's developments will have no impact on Apple's efforts to protect the environment. We power nearly all of our operations with renewable energy, which we believe is an example of something that's good for our planet and makes good business sense as well." Adopted in 2015 by members of the United Nations Framework Convention on Climate Change, including the U.S., the pact was drafted with the intent of lowering greenhouse gas emissions in a bid to combat climate change. Of the 195 countries that signed on in support of the agreement, 145 have since ratified it. Without U.S. government backing, the burden of lowering carbon emissions rests on the shoulders of the private sector. As such, CEOs Smith, Benioff and Pichai also promised to work on green initiatives similar to those adopted by Apple. Apple has long championed its environmental efforts, or as Cook puts it, "To leave the world better than we found it." Working toward that goal, the company seeks to power its entire business, from corporate facilities to server farms to retail stores, with renewable energy. For example, the forthcoming Apple Park campus will draw its energy entirely from green resources. So far, Apple has managed to hit the 96 percent mark and is urging suppliers to follow suit. 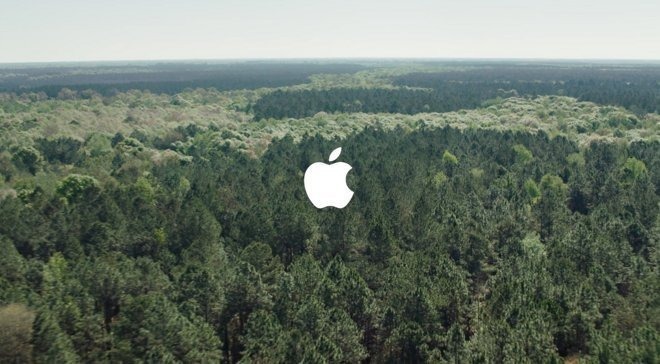 In addition to green energy, Apple is investing in forestry programs both in the U.S. and abroad. Most recently, Apple promised a future in which its products are made from 100 percent recycled material. Though the company has not completely decided how best to keep promise, it is already experimenting with projects like the Liam iPhone recycling robot. I know many of you share my disappointment with the White House's decision to withdraw the United States from the Paris climate agreement. I spoke with President Trump on Tuesday and tried to persuade him to keep the U.S. in the agreement. But it wasn't enough. Climate change is real and we all share a responsibility to fight it. I want to reassure you that today's developments will have no impact on Apple's efforts to protect the environment. We power nearly all of our operations with renewable energy, which we believe is an example of something that's good for our planet and makes good business sense as well. We will keep working toward the ambitious goals of a closed-loop supply chain, and to eventually stop mining new materials altogether. Of course, we're going to keep working with our suppliers to help them do more to power their businesses with clean energy. And we will keep challenging ourselves to do even more. Knowing the good work that we and countless others around the world are doing, there are plenty of reasons to be optimistic about our planet's future. Our mission has always been to leave the world better than we found it. We will never waver, because we know that future generations depend on us. Your work is as important today as it has ever been. Thank you for your commitment to making a difference every single day.